Summertime is like a linen sheet left out on the line— highlighted, outlined and defined by the omnipresence of sunshine. It sets the poppies aglow and warms the strawberries to ripeness. It pops open the peonies and lights the bowl of our days like porcelain. Enlivening and inciting, the sun is the very definition of power-full. 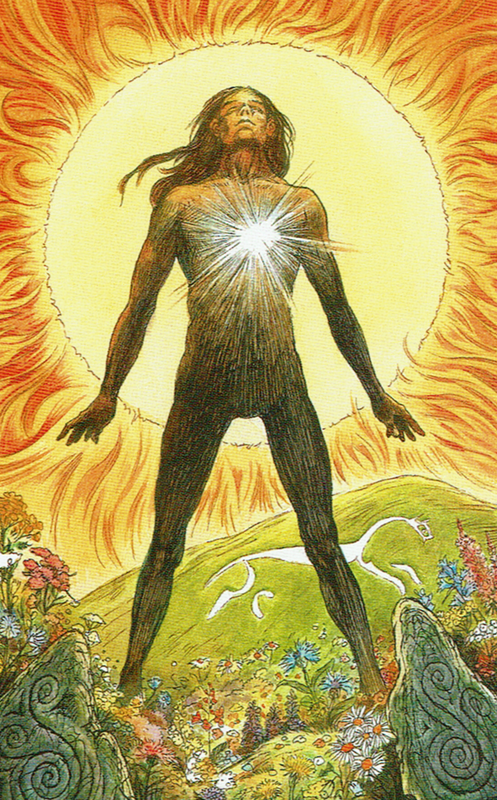 It is because of the deep eminence of the sun, that our Qi, the life force that animates our own bodies, sparks to life. Next time you are outside try baring your chest to the deepness of the light and see what happens. It might take a moment but soon you will feel infused with a power that throws the shoulders back, opens the heart gate, and helps you truly radiate. In summer, the sun infuses its bold energy into all it touches. From the explosion of clover in the fields, to the soft weight of squash, the steady chorus of crickets and thickly heated nights— the warmth of the summer sun vibrates everything a bit faster, hurrying it into life. As human beings, diurnal creatures patterned to the light, our days are also directed by its torch. And as such, we too are stirred. In the traditional tarot, The Sun is a forbearer of triumph, vitality, fulfillment and self confidence. Just like the fires of old, lit in the mouth of cave shelters, the energy of the sun can bring warmth, self assurance and solidity. It also creates important boundaries between the inner sanctum and the outside world. In many ways, fire is sunlight embodied, and it is the tool that forged human kind; when wielded and embodied rightly, fire creates a sacred definition of self. When we can embody the energy of sunshine, as efficiently as the plants soak in its bountiful rays, we can feed the élan of our inner fires. High on a mountain bald, in a meadow licked by wind and encircled by an endless fold of mountains, there is a plant that blooms at the peak of the summer solstice and has been revered for centuries for its light. If you weren’t expressly looking for St. John’s (or Joan’s in homage to Joan of Arc) wort you might easily pass right by. Understated and leggy in its growth, Hypericum will often blend right into a hillside. Easy to ID once you familiarize yourself with its sunny countenance, St. John’s wort is most known for its perforated leaves and translucent oil glands that, when held up to the sun, illuminate in polka dots of light. When I go harvesting St. John’s wort, I must often squint and seek with shaded eyes. Hypericum’s small yellow flowers are like droplets of butter amongst the blocks of yarrow and hearty meadow clover. To go searching for St. John’s Wort is to attune yourself to the subtlety of dappled sunlight. An herbaceous perennial that typically blooms from June until August, St. John’s Wort is a plant with a long history of medicinal and magical lore. In medieval Europe, St. John’s Wort was considered to be an herb of protection, and was often employed against the ‘evil eye.’ Its scientific name, ‘Hypericum’ comes from Greek and means “to ward off an apparition.” Whenever St. John’s Wort has grown, it has been sought and gathered talismanically to help protect and fortify the borders of oneself. One of the most defining ID characteristics of St. John’s wort is its garnet-red essential oil. When crushed during harvesting or medicine making, the leaves and flowers of this plant will turn one’s fingers tips a deep purplish-rouge. The “blood” of St. John’s wort is not only an important ID marker, it can also help us understand the deeper energetics of this versatile plant. In Chinese medicine blood is considered to be the physically animating source that gives us life. When someone is full of their own life force, emanating well being, confidence and health, we say that they have good blood. With good blood, our life force can literally reach every corner of our body, filling out all our capillaries and veins, and the chambers of our inner resources. Good blood helps us inhabit the vehicles of our body, imbuing us with a radiance and power that comes from capturing the source of one’s inner energy. In contrast, a lack of blood is a literal lack of life force, an absence that can cause weakness, instability, low confidence and, unsurprisingly, physiological and psychic vulnerability. In Chinese medicine it is said that if you have strong blood, you simply will not be susceptible to parasites or attacks that come from the outer world. Namely, your own power source, your inner sunshine, is so filling and bright that you are unable to be inhabited by any unwanted energies (bacterial, psychic or otherwise). This is an important medicine of our time, as we come to realize the fine difference between personal power and egoic inflation. Between inner brilliance and anxious manipulation. St. John’s wort, just like the presence of good blood and summer sunshine, is a plant that reminds us that in order to stay whole, healthy and strong we must nourish our personal life force and distinctive light. This lesson becomes particularly important in summertime as our center of gravity tends towards the outside world (just think of all the summertime parties you are required to attend!). In the warmer months it’s vital that we tend the inner fires of personal energy as we are asked to strike out more and more into the outer world. Traditional people knew this innately, hence why this plant was so often used as a talisman to create healthy barriers to outside influences. While we might guffaw at the idea of the evil eye, when we replace this sentiment with our contemporary understanding of the damage inflicted by energy vampires, negative Nancys and bitter gossip, we see just how important St. John’s wort remains. With good blood and good talismans our boundaries we can remain bright— no matter how many ‘dark clouds’ pass through our lives. The physical medicine of St.John’s wort echoes its energetic ability to imbue protection and bring sunlight. Most people who have heard of St. John’s Wort are familiar with it as an herb for depression. Though this one action has become almost exclusively popularized in the last decade, this powerful herb has long history of being used for ‘madness’ and melancholy. Interestingly, some studies have suggested that this action might in large part have to do with its hepatic effects. As a hepatic, St. John’s wort aids our liver in its natural protective processes and clearance, helping to ride the body of lingering compounds (which is one reason why it is contra-indicated for those on life saving pharmaceutical mediations). For example, trials have shown that Saint John’s Wort can speed the clearance of excess cortisol (otherwise known as “the stress hormone”) so we can return more quickly to a state of inner peace. Stagnancy and depression go hand and hand, and when our liver is bogged down it can create an even deeper quagmire in our life. If you have experienced depression or anxiety then you are familiar with the ways in which these emotions can seemingly strip away your personal agency and power. With Saint John’s wort, we bring vital energy and movement to our inner landscapes, freeing up more personal agency and light. One of my favorite ways to invoke the brightly protective energy of this flower is to rub infused St. John’s wort oil into my temples. It can also be particular potent massaged into the area around your thymus gland, in the center of your chest. The word thymus comes from the Greek ‘thymos’ which means “life energy.” If you truly want to feel like super woman, give your thymus a few hard Tarzan fist knocks afterwards and send out a loud whoop. St. John’s wort is also a strongly protective medicine to guard our outermost selves. The flowers and above around parts are an effective topical remedy for bruising and burns and other abrasions arising out of disastrous interaction with the outside world. The herb is also an important antiviral, used specifically against enveloped viruses in vitro, a class of viruses which are responsible for many long-term viral infections such as cold sores, herpes simplex II, shingles and mono(nucleosis). This vibrant solar plant can be a powerful remedy for nerve or muscle pain as well. It can work wonders, as both an external oil and/or internal tincture, for sciatica, back spasms, neck cramps, TMH and neuralgia. For many people, the over-reactivity of our bodies’ muscular and nervous system and be traced back to our tender interaction with the outer world. It is common for sensitive nervous systems and tense muscles to overcompensate in response to stressors in our environment. With St. John’s wort, we can take in the live-giving energy of the sun and revitalize our own stores of enlightened power. ** Perhaps unsurprisingly, SJW can cause photosensitivity (extreme sensitivity to sunlight). So be careful when handling and remain aware of your time under the sun when taking the medicine (externally or internally). ** Please use caution when using SJW internally as it can speed the clearance of life-saving drugs, and have potentially serious interactions with other medications. Let sit for 4-6 weeks and then strain into a clean, dry jar. Use a funnel lined with a fine weave cloth to separate the oil from any plant material. Your oil should be a rich red color. Will keep many years if stored in the refrigerator.